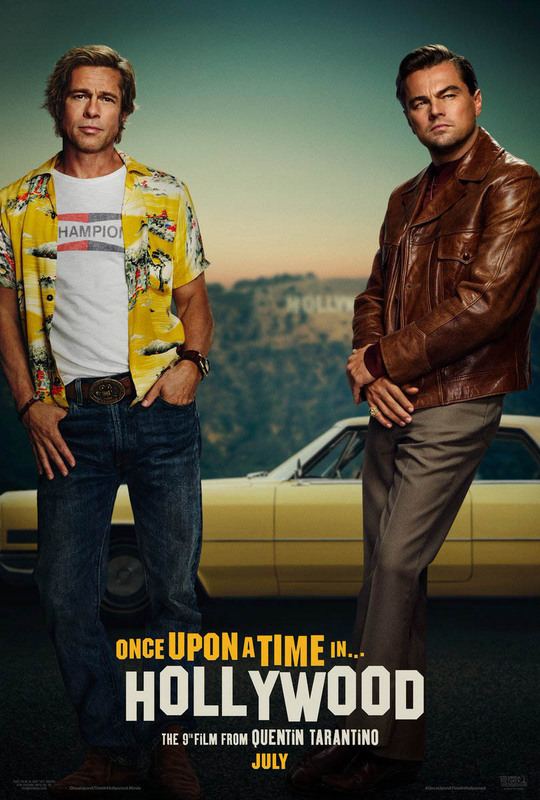 Quentin Tarantino roped in Hollywood heavyweights Brad Pitt and Leonardo DiCaprio for his latest film Once Upon a Time in Hollywood, and the first official movie poster was unveiled this morning. Unfortunately for everyone involved, said poster is cheesy as heck. As you can see above, the poster features Pitt wearing a Hawaiian shirt and jeans, and DiCaprio is decked out in a leather jacket and slacks. And while the costumes may be excusable for the sake of their characters, there's no discernible reason the pair of actors are completely out of scale and in front of a clearly green-screened version of the Hollywood sign. As previously reported, DiCaprio plays television star (and neighbour to Sharon Tate) Rick Dalton in the movie, while Pitt portrays Dalton's stunt double Cliff Booth. The film also features Margot Robbie, Al Pacino and the late Luke Perry. Once Upon a Time in Hollywood is slated to hit theatres on July 26, but in the meantime, check out some of the best reactions to the poorly made poster below. hey guys it's me ! The person who designed the once upon a time in hollywood poster! Time to take a big sip of coffee and see how twitter are loving it!